Ross Purse has given unselfish service to others in spite of difficult circumstances. As a prisoner of war for four years during World War II, his character and sense of duty made him stand out among his fellows, along with his energy, hard work and reliability. When he returned to Canada after the war, with a visual impairment, he went to work for the Canadian National Institute for the Blind. In his years with the CNIB, he provided national leadership in the development and implementation of programs for the welfare of the blind and for the prevention of blindness. 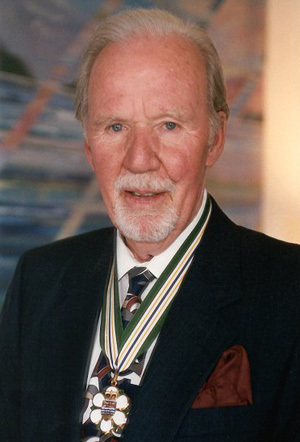 His work on the Unmet Needs of Blind Canadians study in 1976 created a different understanding of the CNIB’s structure, mandate and service programs. Internationally, Ross Purse is a life member and past secretary of the American Association of Workers for the Blind, he has served on the executive of the World Council for the Welfare of the Blind, as chairman of its North America-Oceania Region. He served on the Executive Boards of the Royal Commonwealth Society for the Blind, the International Agency for the Prevention of Blindness, and was founding chairman of the Canadian Coordinating Committee for Blindness Prevention, to mention a few. Since his retirement, Ross Purse has continued as an active member of the Sir Arthur Pearson Association of War Blinded and Rotary International.